My article You do not invite crisis that you cannot tackle appeared in The Pioneer on November 3. Mao needed a pretext ‘to teach India a lesson'. 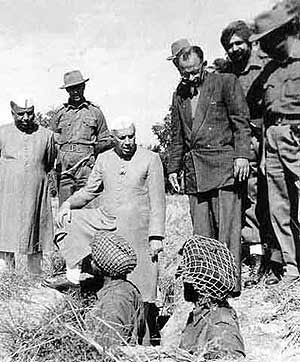 Some senior officers of the Indian Army and the country’s politicians offered it to him, which is why 1962 happened. One of the reasons why the Sino-Indian conflict has remained a deep scar in the nation’s psyche is that very few people know what exactly happened on the slopes of the Thagla ridge in October 1962, though one does not need to be Inspector Jacques Clouseau to discover why the famous Henderson-Brooks report has been kept out of the eyes of the Indian public for 50 years. The reason is simple: In 1962, the bosses in New Delhi were unable to tell the local commanders where the border in the Tawang/ Ziminthang sector was. Between 1962 and 1965, RD Pradhan was then Defence Minister YB Chavan’s Private Secretary. In his memoirs, he provides some insights on the issue: “Chavan was apprehensive that the committee may cast aspersions on the role of the Prime Minister or the Defence Minister.” Mr Pradhan adds: “(Chavan’s) main worry was to find ways to defend the government and at the same time to ensure that the morale of the armed forces was not further adversely affected.” Mr Pradhan concluded: “Chavan earned the gratitude of the Prime Minister.” Was it by classifying the HBB report forever? In 2008, answering a question on the HBB Report, Defence Minister AK Antony told the Indian Parliament that the report could not be made public because an internal study by the Army had established that its contents “are not only extremely sensitive, but are of current operational value.” Nobody will believe that a 49 year-old report is still of ‘operational value’. In 2005, veteran journalist and former MP Kuldip Nayar requested, under the RTI, the Ministry of Defence for a copy of the report. The survey had been completed in 1913 by Capts Bailey and Morshead, but it is true that it was rather sketchy (one inch to eight miles). If one follows the watershed principle, the Thagla ridge was the logical border, but the fact remains that the old map which was the reference for India’s position on the location of the McMahon Line, showed the Thagla ridge and the Namkha Chu, north of the Red Line. Further surveys were unfortunately not conducted after India’s independence. In 1960, the Government of India had mooted a new policy to establish posts right on the border; it was the famous ‘Forward Policy’. The siting of these posts and their exact location was, however, decided mainly by the Intelligence Bureau and not the Army. The local Commanders (Corps, Division and Brigade) were not happy and they made it known, but nothing could stop the folly of the ‘authorities’ in Delhi. As Maj Gen Niranjan Prasad noted, the local commanders had no choice, though they could certainly have resigned, but in an almost war situation, it was not an easy decision to take. The Intelligence Bureau and its Director, BN Mullick had no clue about the exact position of the border and the Chinese preparations. On 14 August, 1962, Brigadier DK Palit, Director of Military Operations visited the Corps Headquarters in Tezpur. He was told about the issue about the Line. When Palit enquired with S Gopal, the Director of the Historical Section, Gopal explained that since the boundary talks with the Chinese in 1960, the Government of India had been aware that the actual terrain in the area of the tri-junction was different from that depicted on the Simla map. But Palit adds: “What Gopal had not told me — and I found out only later — was that the Chinese had not accepted our arguments and had counter-claimed Thagla ridge, as Chinese territory.” By then, it was already too late to go back, at least for the egos of the main actors in Delhi. Mao needed a pretext ‘to teach India a lesson’. Some senior Indian Army officers and politicians offered it to him. However, the fact that the Chinese attack occurred simultaneously in all sectors (Tawang, Walong in NEFA and Ladakh) is certainly proof that the operations had been prepared well in advance by the communist regime in Beijing, which didn’t really need a pretext.